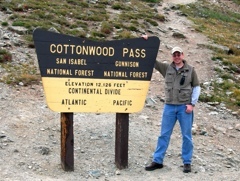 Cottonwood pass is a continental pass just west of Buena Vista, CO. At 12,126ft, the views are spectacular. Here are a few shots from the pass, and you can find more here. Cottonwood pass is a shortcut between Buena Vista on the Eastern side of the divide, and Taylor Park on the Western side of the divide. Two national forests border the pass; with San Isabel National Forest to the Atlantic side, and the Gunnison National Forest on the Pacific side. There's an abundance of camping, hiking, and white water rafting for hundreds of miles in all directions. 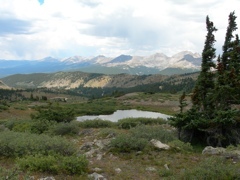 At the top of the pass, there is a large area to park vehicles, dozens of trails for hiking, bathroom facilities, a couple of picnic benches and a 360 degree vista unlike anything I've seen. The roads on the Eastern slope are paved and well maintained. The roads leading down the Western side of the pass are hard-packed dirt. The roads are very slick after rains, but otherwise passable in any vehicle (including cars). The drive between Buena Vista and Taylor is very scenic and well worth the effort. I hope to make a return trip in 2006 in order to take some more photos.